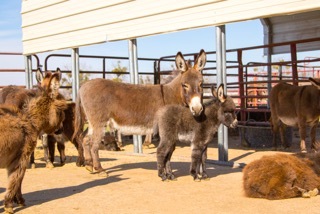 According to a press release today, San Angelo based Peaceful Valley Donkey Rescue (PVDR), the country’s largest equine rescue, has rescued 85 jacks and 77 jennets of which 80 percent are pregnant and will increase the total number of rescued miniatures to well over 200 from just one case. According to the rescue case, 5-6 breeding pairs were released onto 250+ acres and left to their own devices. Donkeys are prolific breeders, and without proper controls, their numbers can double every four years. These donkeys came from Coleman County Texas. As these donkeys were never handled by their owners, they are all non-social towards people and will have to be gentled before they can be placed in PVDR’s National Donkey Adoption Program. To be considered a miniature, donkeys must be 36” or less measured to the withers or highest point of the back. This particular rescue involves donkeys ranging from a few days old to donkeys in their teens. One of the young jennets (female donkey) is missing half of her lower leg and will require a prosthetic limb in order to give her a normal life. The initial cost of the rescue will exceed $30,000 to cover castrations, vaccinations, microchipping and deworming. The Peaceful Valley Donkey Rescue is an IRS recognized 501(c)(3) non-proﬁt organization. Peaceful Valley manages over 3,000 donkeys all across the country and has adoption facilities that span from Coast to Coast. 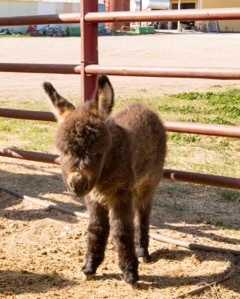 For a more detailed and in depth story about the miniature donkey rescue, click here for PDF. Stephanie Lindgren was born and raised in Pflugerville, Texas. She currently attends Angelo State University, and is pursuing two degrees, Animal Science and Psychology. She is roommates with reporter Zoey Hanrahan, who also works from San Angelo Live! Stephanie likes to go outside and play with her dog as well as sit on the couch and watch Netflix. In her spare time, she loves to research about killer whales because they are her favorite animal and she would love to work with them in the wild one day. Stephanie will be covering topics mostly related to agriculture and the medical field during her time with San Angelo LIVE! I've always known a female donkey as a Jenny. Never heard one called a Jennet. Both are in the dictionary, but for 75+ years, I'd never known that. Ha! I learned a new word today! For me, anyway. We have seen the donkeys at The Old Chicken Farm Art Center on 1st Saturdays. They are precious!